Does driving to a weekly guitar lesson take up too much of your time, or is it impossible due to your geographic location? Traffic got you down? Consider taking guitar lessons from me via Skype Video. 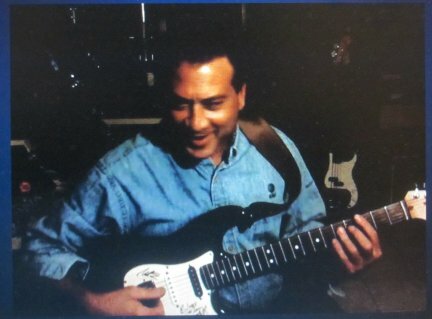 Through Skype you can sit in front of your computer's webcam (either built in or external) with your guitar, I sit in front of mine, and we can see and hear each other play guitar, in real time. Laptops with built in microphone and webcam are the easiest to use but desktop computers can be easily set up for sound and video as well. Here are two screenshots from a recent lesson I gave: the first is me in Seattle, the second is my student in Andover, MA. Simply go to Skype and download their software. If you need a webcam, Logitech makes good ones. You can download webcam software from Logitech and you are ready to go! 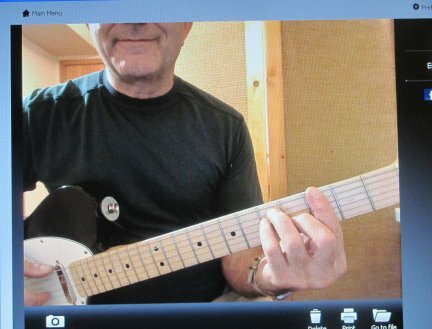 I email you lesson plans and instructional curriculum before the lesson and we can see and hear each other's guitar.Email me for more information. Rates are a reasonable $35 per half-hour lesson and you pay through Paypal. It's easy, convenient, fun, and it really works! If you've read this far, you're probably interested. As a free gift (is there any other kind of gift?) here's an Introduction to Guitar, you'll need to download free Adobe software to read it.